Need comfort? Make this soup. 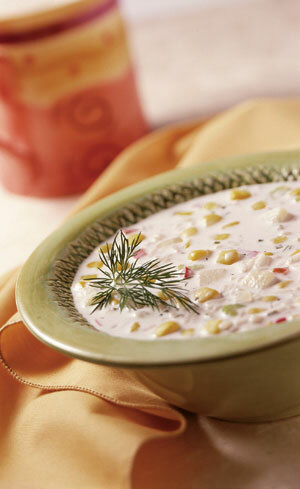 Frontier Soups’ Corn Chowder mix is a great food find. We’re sad now that winter is turning into spring, because we won’t have an excuse to whip up a batch of one of our favorite uber-comfort foods, the luscious corn chowder from Frontier Soups. Frontier’s entire line of dry soup mixes was a NIBBLE Top Pick Of The Week last year (read the review). The $6.00 bag makes about two and a half quarts of thick, chunky soup (BYO potatoes, chicken broth and heavy cream), which makes us very happy: Depending on who is in the house, we can enjoy it for two or three days. (We straddle the line of wanting to be generous and offer it to everyone, and wanting to be covetous and keep every precious drop for ourselves.) As with many of Frontier Soup’s mixes, we couldn’t find a better recipe if we tried; most of the soups taste as good cold as they do hot. We love the corn chowder plain with some fresh dill, but you can add glamour with crumbled bacon and/or grated Monterey Jack or your favorite semisoft cheese (a mound of cheese curls on the surface of the soup makes an excellent presentation). Turn the soup into a main course by adding diced chicken breast or seafood—poached salmon, haddock or cod, crabmeat, clams or oysters (or a mix). If it’s already warm where you are and a thick, creamy corn and potato chowder seems too wintry, try the spring-like Potato Leek Soup and Asparagus Almond Soup. Find more of our favorite soups in the Soups & Stocks Section of THE NIBBLE online magazine. March is National Sauce Month, so share the love. If you make a favorite pasta sauce—or if you’ve been thinking of trying a new recipe—all of that work can make many more people happy. Just make double or triple the amount you usually would. You can freeze the extra sauce in pint containers, not just for your own use but as gifts. Birthday celebrants, sick friends, new parents and new neighbors are just a few people who would appreciate something easy-to-make for dinner. Sending guests home from a dinner party with a pint of your homemade sauce is a nice party favor—something they’ll re-thank you for when they enjoy a second delicious dinner. Read about our favorite ready-to-eat sauces in the Pasta & Sauces Section of THE NIBBLE online magazine. 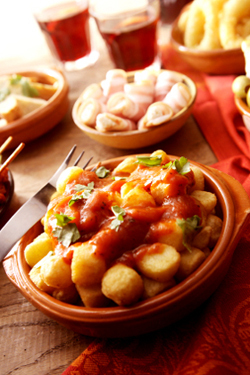 Red sauces are not just for Italian food: Try them on roasted potatoes. Maple Leaf Farms sells a variety of succulent Pekin duck products, some of which are pre-cooked and ready to eat in just two minutes! It’s some of the best pre-cooked duck we’ve ever tasted; the raw duck breasts we cooked from scratch were also superb. But we love being able to have duck more often, just heating and eating without the heavy aromatics of roasting duck from scratch. If you love duck—and would love to enjoy it more often if only someone would cook it for you and serve it to you in your own home—see what Maple Leaf Farms has to offer. Read our review of their duck products. It will also unravel the mysteries of all those duck terms—the “m” words (muscovy, magret, mallard and moulard), the difference between Pekin duck and Peking duck, and what exactly is a confit. 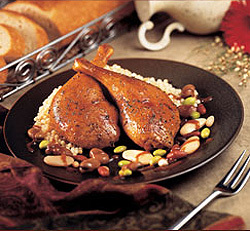 Don’t have an entire day to make confit of duck? 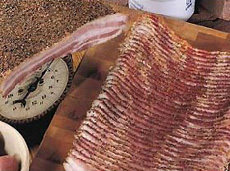 Buy it ready-made from Maple Leaf Farms, heat and eat! MackenzieLtd.com. Now, we must ask: Why would anyone make Surf &Turf Day fall on February 29th? Should we celebrate this tasty holiday only once every four years? Perhaps it’s put on Leap Day because of its ostentatiousness—it is, after all, a dish that combines the two most expensive dishes on the menu, lobster tail and filet mignon. Of course, mankind has been combining meat and seafood in meals since the dawn of plenty. 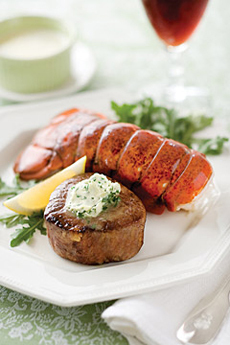 Fine dining establishments served both lobster and steak on the same plate in the last quarter of the 19th century. Diamond Jim Brady was just one of many gourmands whose table was laden with both beef and lobster. But the disk known as Surf and Turf (or Surf ‘n’ Turf, to be even more vulgar), is an American invention. However, there is a second claim, without printed proof, that the same dish by the same name was served at the Sky City restaurant, in the Space Needle, at the 1962 Seattle World’s Fair. The dish is called “Reef and Beef” in Australia. Evidently, ostentatious displays are not limited to the U.S.
Don”t be constrained by lobster and steak. Pick your favorite seafood and meats: crab cake, crab legs, scallops or shrimp with lamb chops or pork chops, for example. Or, enjoy a hot dog in a bun paired with lobster, shrimp or tuna salad in a bun, a clam roll or lobster roll. Fish and chips with a tasty sausage also has its appeal. As does crab cake and ribs. We could fill the Leap Days for the rest of our life with different options, and not run out. Happy Surf & Turf Day!